I spent the whole day yesterday making cards, and I thought I would share my favorite one here. I don’t make cards regularly anymore (as you can imagine seeing how this blog has been dead for three years!) but once in a while I try to make some time to design a whole bunch of cards. What I think made this card the winner: The bright colors, the gold frame, and the contrast between the the dark gray and the white center, and I love anything with a frame! Did you notice my face on the card? I almost didn’t put it, this is just for fun! A while ago, Jen had sketched this image based on my picture, it doesn’t really look like me (that wasn’t the intention I think) but I thought it was very cool! If you care to see my other cards, you can find them here. I hope to post more often and share something interesting once in a while. Let’s just hope that it won’t be another three years before my next post! I stamped three of the large flowers from this set on watercolor paper using permanent ink. I used Ranger’s Archival black ink. I then watercolored them using some Peerless watercolors as well as Gansai Tambi watercolors. I trimmed all the flowers and arranged them on a black card base. The sentiment is from the Altenew Sentiments & Quotes set, and it was stamped on Birch Wood paper using pigment ink. If you haven’t already, do stop by the Runway Inspired Challenge blog. There are some beautiful cards by the rest of the design team! 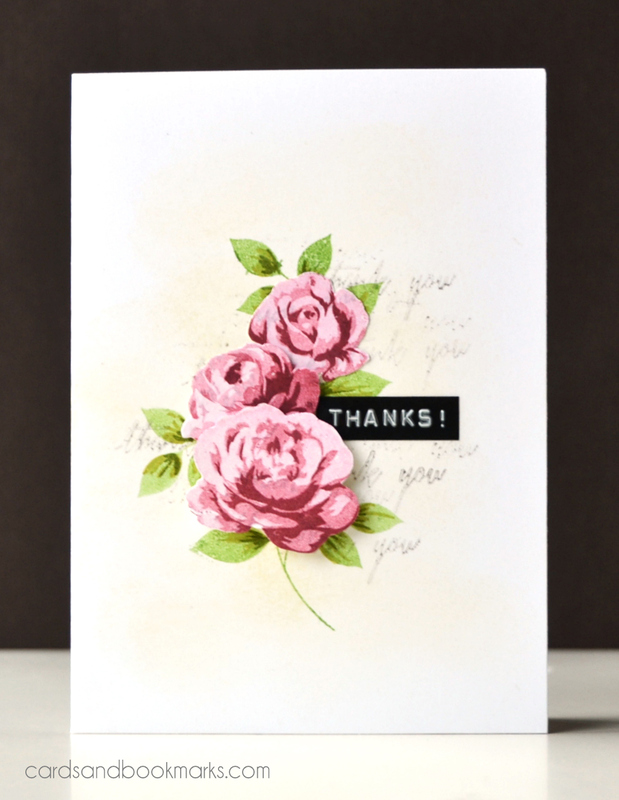 I used the Altenew Wild Hibiscus stamp set to stamp a background pattern on a white card base. I used Desert Night crisp ink, and partially colored with Copic B16. The sentiment was embossed in white on a piece of red card stock. Have you heard about the new challenge campaign that Jennifer Mcguire launched? I think it is amazing that she is encouraging us to send handmade cards/treats to others. 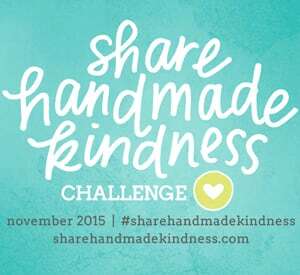 This week’s challenge theme is to share handmade kindness with friends and family. I will be sending this card to my mom. I haven’t sent her one in a while! To learn more about Jennifer’s campaign, please visit sharehandmadekindness.com. To join the fun at Runway inspired Challenge, visit the blog here. There are some gorgeous projects from the rest of the team! I know I have been absent for a while again 😦 but there is a good news, I started crafting in a new direction! Most of you card makers may also do scrapbooking, but in my case, I have never done it before! So a few weeks ago, I decided that it was time to get my hands on it. I even bought a Polaroid camera for this purpose alone! (I am too lazy to edit photos and get prints!). 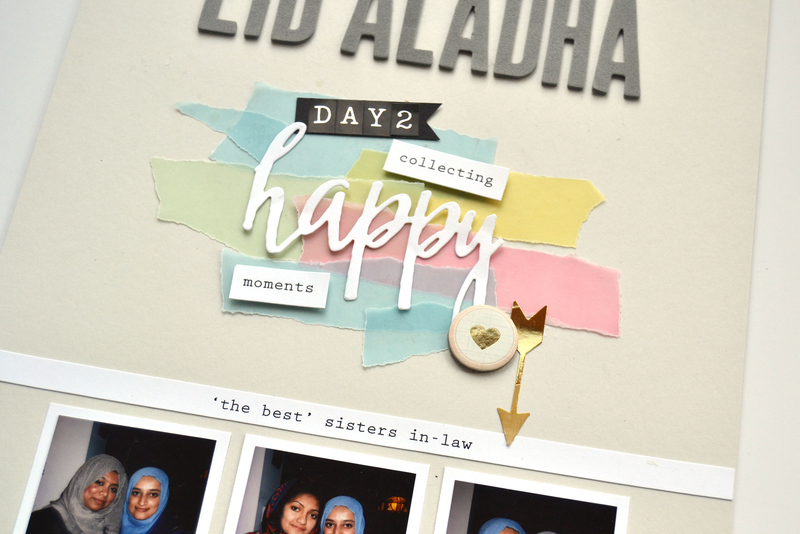 It was Eid about three weeks ago, and I decided to document the celebrations using my new camera 🙂 This particular Eid is celebrated on three consecutive days, and surprisingly, my family managed to be in three different states during those days! Today’s layout is from day 2 in New York. Since I never scrapbooked before, getting started was definitely a challenge! I browsed some blogs and found my inspiration for layouts here. 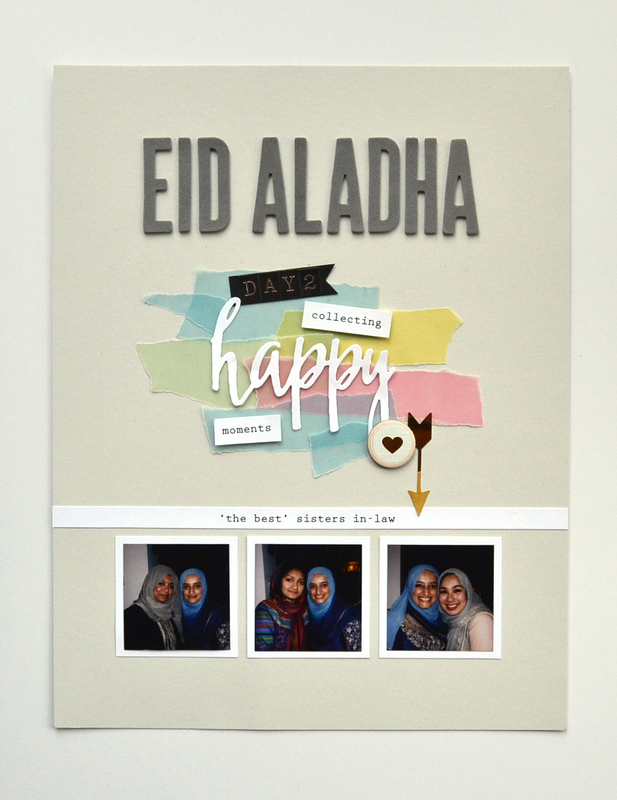 I loved the clean and simple layouts, and since I had been thinking of creating A4 size layouts, this was perfect. For design/color inspiration, what better place than turn to Runway Inspired Challenge? I loved the overlapping strokes of color, and thought it would be best translated into overlapping strips of colored vellum. Oh, and in preparation for scrapbooking, I also bought some embellishments. The title was made using foam letter stickers from American Crafts, and the round chipboard and arrow sticker accents are from Maggie Holmes’ Open Book and Craft Market collections. 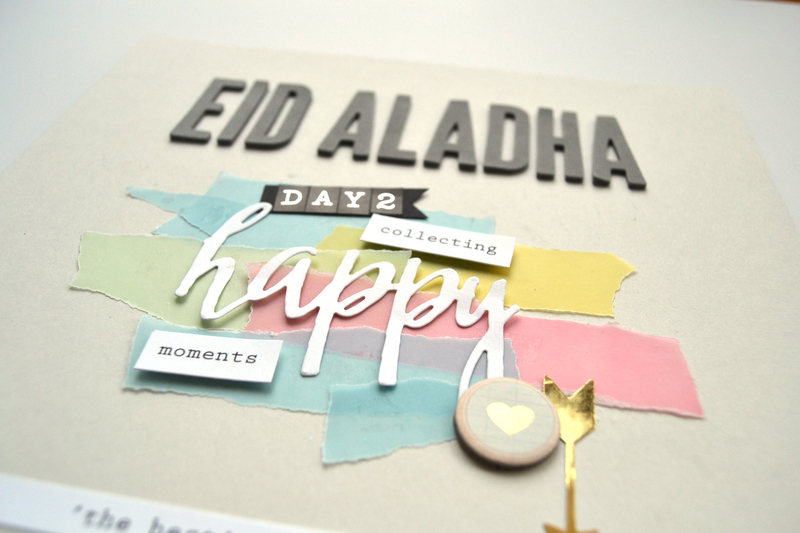 The ‘happy’ was die cut from Altenew’s happy die. ‘DAY2’ was made using Typewriter Alphabet Stickers from Studio112. All other words were printed on white card stock and cut intro strips. Even though it took me a few hours over a span of a couple of days, I enjoyed the process very much. I created a few more layouts afterwards, and I hope to share them soon! There is still some time left to enter the current Runway Inspired Challenge. Make sure to visit their blog for more inspiration. I have been absent for a long time from this blog. Life got busy and I took a break from designing cards. A few days ago I received a beautiful email from Aileen. She is a blogger from Australia, and she was wondering about my prolonged absence. It was a very sweet email and I was so very touched! 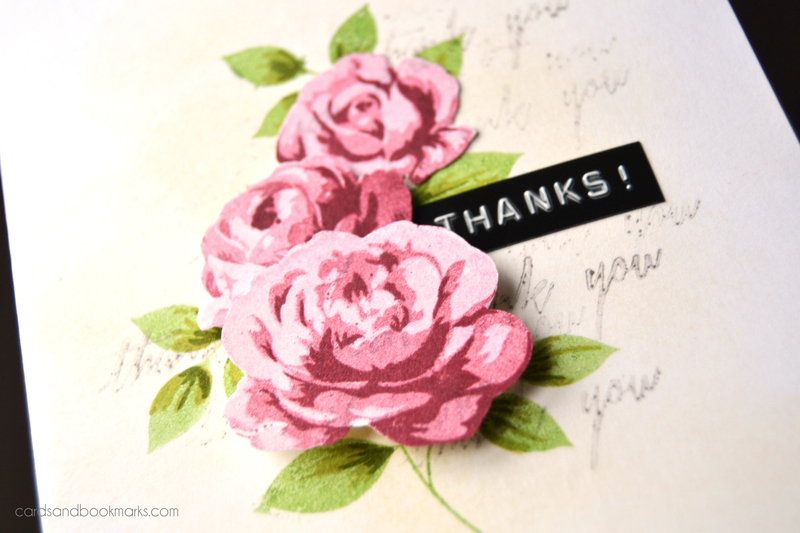 I chose one of my old Stampin’Up! stamp sets (Growing Green) and started stamping on a white card base. After stamping, I colored the images with various Copic markers (G000, BG34, YR000, YR12, RV10, RV11, Y11, Y13, YR16, YR38, B000, B01, BV11). For the greeting, I used a DYMO label maker, and layered it over another piece of DYMO Orange label. I am glad to finally make some time to design and create, and I hope to continue to do so. To view the challenge details, and enter to win, please visit the Runway Inspired Challenge blog. Our sponsor is Ellen Hutson, and the winner will receive a $25 gift card to Ellen Hutson! 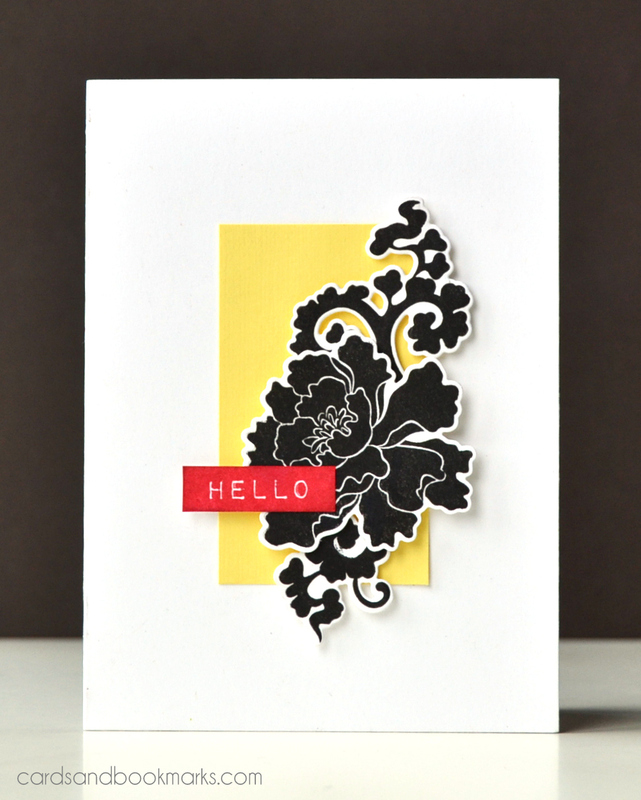 Instead of doing patterns, I decided to stamp line images in black on colored card stock. I used the Doodle Blooms set from Altenew and the matching die set to create all the floral pieces. The sentiment is from Thoughts & Reminders. Make sure to stop by the Runway Inspired Challenge blog for some beautiful inspiration from the design team. It has been a long absence! I have a couple of cards to share which were inspired by the current Runway Inspired Challenge. The current challenge is sponsored by Winnie & Walter, and we had the chance to play with their gorgeous products! Love the gemstones from the My Precious set! Here I stamped them in a random pattern on a 110lb heavy weight white card base, then added some water color to each. I stamped them with Versafine Onyx black and clear embossed on top to make sure the ink doesn’t bleed when I add the water color. I covered the bottom part of the card with a gray card stock on which I stamped the large ‘you’ in white (love the font!). I stamped the heart gemstone with Memento Tuxedo black ink, then colored it with Copic markers (W0, W1, W2, W3, W4). Next I stamped the sentiments, the sparkly lines, and finished the card with some gold splatter. I think Runway Inspired Challenge and Winnie & Walter work well together, they are both so trendy! If you haven’t already, make sure to stop by the Runway Inspired Challenge blog, for the design team has made some beautiful cards! I am back with a few cards for the latest Runway Inspired Challenge. The first thing I noticed in this outfit was the real-life floral images. My first instinct was to either use roses/flower stamps or elements in a variety of bright colors. However, I decided to take advantage of a floral themed calender that I had. The back of the calender had 12 thumbnail images of floral photography. I cut them out and used them to make a set of cards. Most of these squares are mounted on foam tape, and the sentiments are from old Hero Arts and Close to My Heart sets. I love saving bits and pieces of pretty packaging, magazine pages, clothing tags, or in this case calender pages, and do a creative use of them later. I hope you feel inspired to join in the challenge. For more details please visit the Runway Inspired Challenge blog. I am back after a looong absence! 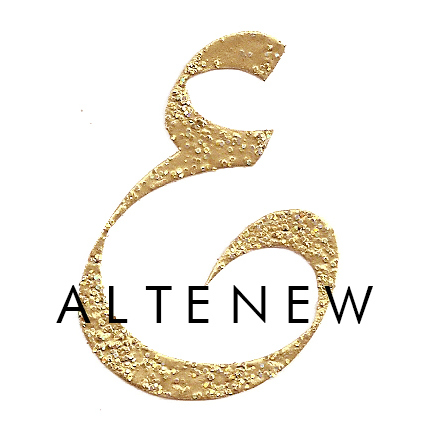 Recently I have been very occupied with Altenew, and I hardly had a chance to craft. However, today I finally made some time and designed a card for the latest Runway Inspired Challenge. Oh the bold colors! I wasn’t sure what to make at first, and in fact, my first card came out really bad! 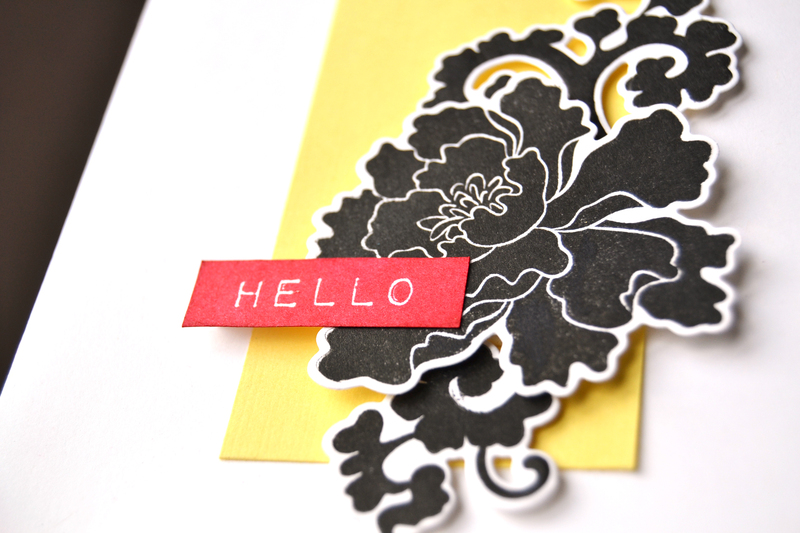 I started by stamping the smaller trio of leaves from the Altenew Peony Scrolls set. My original goal was to create a cluster in the center, and I had my card base in portrait position. However, my deign shifted down and to the right. Instead of starting again, I simply continued stamping off the edges, and added a single leaf cluster on top left (in portrait position). I colored the leaves with Copic markers. When it came time to place the greeting, no position seemed to look good. After much deliberation, I turned the design landscape, and I think it worked. Sometimes you start with a certain design in mind, and end up with a completely different one! To join the challenge, please visit the Runway Inspired Challenge blog. You still have until Friday midnight EST to enter. Oh and I almost forgot! The sentiment that I used here is from Bossy Jocie. I love the cute and whimsical feel of it. Bossy Jocie also happens to be the sponsor of this challenge. One lucky winner will receive a $20 gift card to Bossy Joscie! Last week I made a card for the latest Runway challenge, and completely forgot to write about it! I used stamps from Altenew Vintage Flowers and Label Love sets. The images were stamped on white card stock and then die cut with coordinating dies (to be released next week!) I used a Walnut Cream card stock from Bazzill for my card base. Do stop by the Runway Inspired Challenge blog to see what the rest of the team picked for their inspiration! Aren’t the pattern and the colors simply beautiful? The flowers are from Altenew’s Peony Scrolls set. The yellow ones were colored with a Copic marker, and the Gray one was stamped and water colored with Distress ink Iced Spruce. The background is a patterned paper from Studio Calico. If you haven’t already, stop by the Runway Inspired challenge blog for more details on how to play along this challenge. There is a beautiful inspiration at Runway Inspired Challenge this week. I loved the layers of dark and light colors, and thought Painted Flowers would work perfectly for this look. 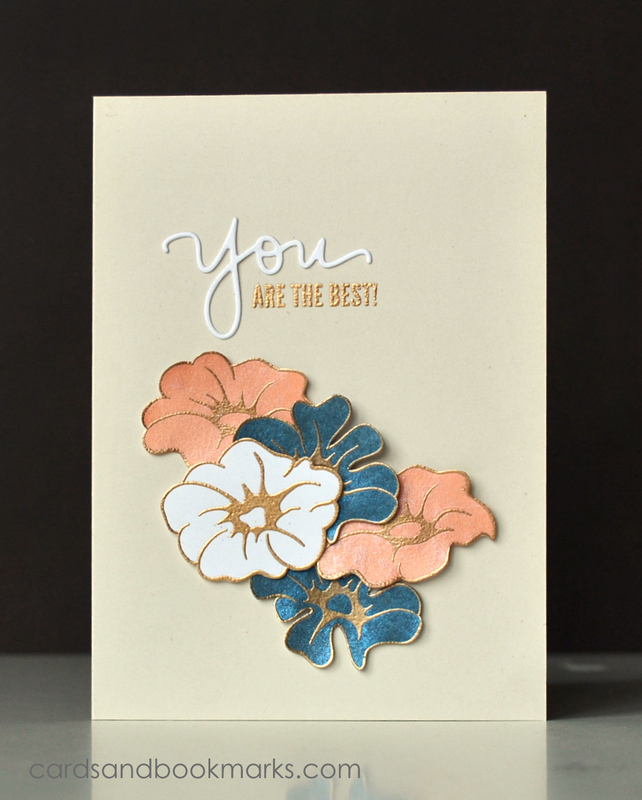 I stamped the flowers in Close to My Heart’s Honey and Goldrush inks. Originally I had planned to emboss the outlines in white, but it so happens that I don’t have any white embossing powder at the moment, so I used gold. You will notice some inky smudges in the background, that wasn’t done to cover a mistake. When I realized that I didn’t have any white embossing powder, I started stamping in white pigment ink. The outlines showed over the flower, but not beyond it. I thought if I sponged some ink, maybe somehow, the pigment ink will show through! (I wasn’t thinking clearly). Spare time is so hard to come these days, that I wasn’t willing to start over, so I embossed the outlines in gold. This week’s sponsor is Ellen Hutson, and the winner will receive a $25 gift certificate to her store. The first time I heard of the Paper Crafts & Scrapbooking magazine was just about two years ago when Jen announced that Susan R. Opel was to be a guest designer at Runway Inspired Challenge. I said Yay! although, to be honest, I didn’t know who she was at the time! Everyone on the team seemed excited about it, so I thought it was best not to reveal my little secret . Since then, I have gotten to know more about her and the magazine she worked for. I could tell right away that this magazine was not just a magazine, but a vital force of an amazing community of artists. I admired the high standard it held, and it inspired me to think out of the box and give my best at creativity. Thank you Paper Crafts & Scrapbooking magazine for all the years of hard work and inspiration you provided to this community! I wish each and everyone behind this magazine all the best. You may have come here from Clare Prezzia‘s blog, if not, you can always start at the beginning of the hop here. Today I am very honored to be a guest designer at Virginia’s View challenge. 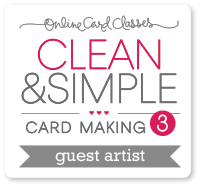 If you have been out and about blog-land around 2011-2012, you may have heard of this challenge at a blog that used to be called Lily Pad Cards. I participated in some of their challenges (including Virginia’s) until they closed down in May 2012. Earlier this year, Virginia started a challenge of her own, and I was happy to see that she gave it the same name! I hope you will stop by Virginia’s View Cgallenge, and check out the beautiful inspirations in that blog!